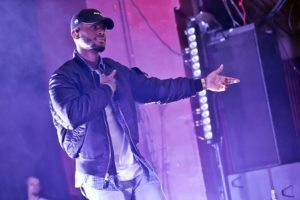 Last Wednesday, Toronto was visited by the one and only, Bryson Tiller. The “Don’t” singer shared the Echo Beach stage with opening acts such as H.E.R and Metro Booming. Fans were lining up for hours to make sure they got front view at Tiller’s Set it Off show. Just an hour before the gates opened, nearly 200 fans were already ready with their tour merch. The show started off with H.E.R performing her widely known song “Focus” along with many other songs from her hit mixtape. The crowd was then surprised by Canada’s very own Daniel Caesar as he shared a duet with H.E.R.. Metro Booming soon took the stage right after. The crowd was getting hyped to all of his hit songs as well as other fan favourite songs such as Lil Uzi, Drake and Future. Soon enough the crowd was filled from back to front as Tiller hit the stage. Performing his hits such as , “Self Made”, “Run Me Dry” and closing off the show with, “Set it off.” Not only was his stage presence incredible, he surprised the crowd with Rexdalle’s very own NAV who performed a couple of his old Soundcloud songs such as “Myself”. Not only did Bryson perform songs from his new album but as well as many of his old songs from his first debut album “Trap Soul”. Songs such as “Don’t” and “Exchange” filled up with in sync voices in the outdoor show. Tiller was able to deliver a beautiful tour along with incredible interactions with his fans. I speak for many when I say, we can’t wait for the next time he flys down to Toronto!